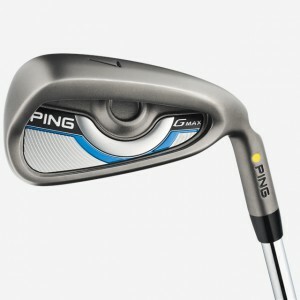 Ping Golf has never been a company known for hyperbole, so when it says its new GMax iron is the “longest, straightest iron ever,’’ you should listen. The iron features Ping’s COR-Eye Technology, which the company says simultaneously activates the sole, face, and top rail to increase ball speed up to three mph over previous Ping models, providing greater distance with control. COR-Eye, according to Ping, creates a faster ball speed that is constant across the entire face, so even off-center strikes deliver longer, straighter results. The company says a new cavity structure houses a concealed Custom Tuning Port that connects to the sole. With this deeper position and wider sole, each iron’s center of gravity is moved lower and farther back to increase the MOI for more forgiveness, accuracy and consistency. Ping says distance-generating lengths and lofts are optimized for efficient gapping with the distance control and high trajectory needed to hit and hold more greens. An enhanced leading edge, more trailing edge relief and refined bounce help optimize turf interaction. The 4- thru 8-iron faces are heat treated using a specialized process that Ping says strengthens the material by approximately 40 percent, creating a Hyper-17-4 alloy and allowing the face to be thinner for greater flexing and faster ball speeds. Longer blade lengths and increased offset maximize forgiveness and ensure a higher max shot height. The GMax iron (suggested retail price $121.25 for steel and $136.25 for graphite) will be available July 30 a 4-9 set. A pitching wedge, utility wedge and sand wedge also will be available.